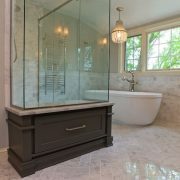 Key Design Element: A color story that transitions from a bedroom sanctuary to a crisp & refined master bath. Must-Have: Remodel in a timeless way that feels fresh but classic. 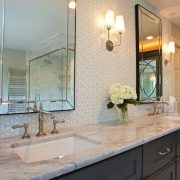 Aesthetic: After helping this client with their Colorado mountain home, we were commissioned to tackle a master bedroom & bath remodel of their Georgian Style home in Iowa. Prior to the remodel, the bedroom & bathroom felt dated due to dark wood trim & lacked usable square footage because of an angled, low ceiling line. 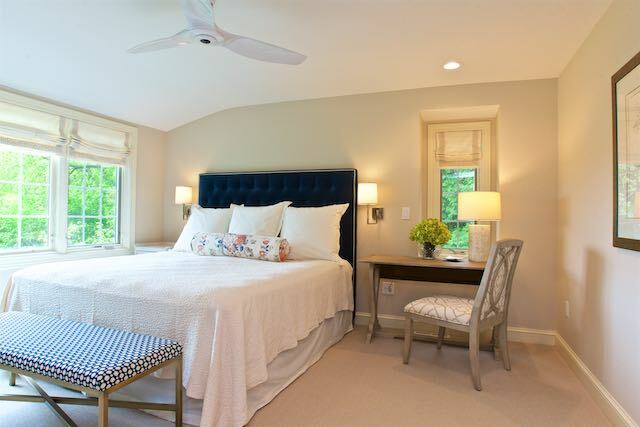 We were able to reconfigure the space by changing the footprint of the entire master suite. This allowed the room to accommodate a king size bed, built-in storage space for media & display purposes as well as a beautiful walk-in closet space. 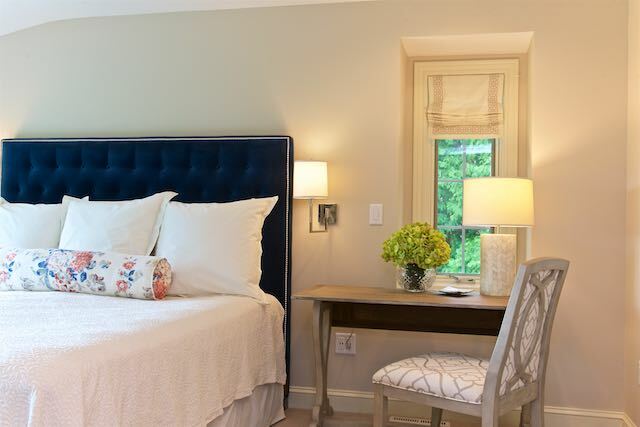 The space also became lighter & brighter with the addition of white trim, light linen fabrics on the draperies & bedding & lighter wood finishes on the furniture & built-ins. 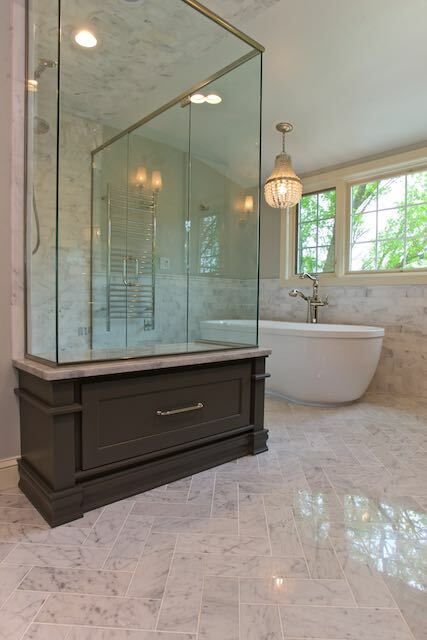 The master bath was completely gutted & reconfigured to allow for a large walk-in shower, free standing tub, dual vanities, beautiful built-in linen storage & a private toilet room. 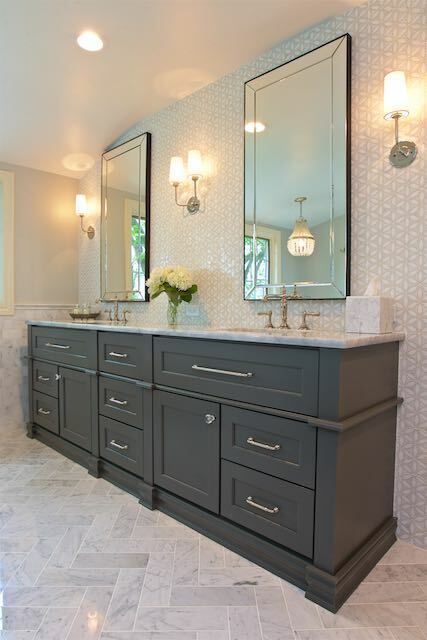 We selected Carrara marble for its timeless appeal & had it installed in a herringbone pattern on the floor. 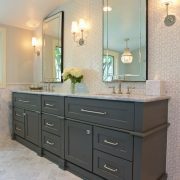 As a modern complement the cabinets & vanities were specified in a charcoal grey painted finish. 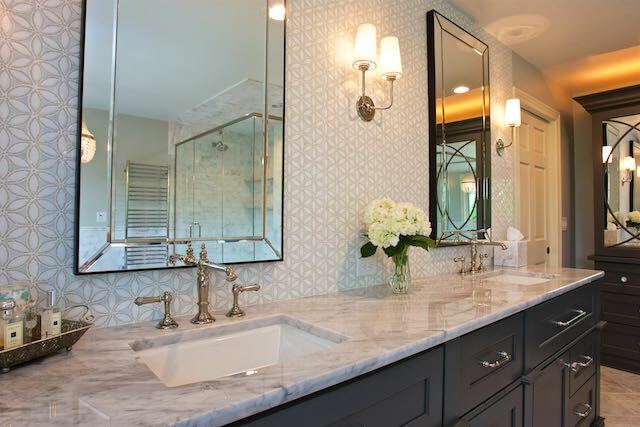 Every detail was thoughtfully derived, but the true focal point of this bath is the floral, glass & marble mosaic tile installed floor to ceiling on the vanity wall.